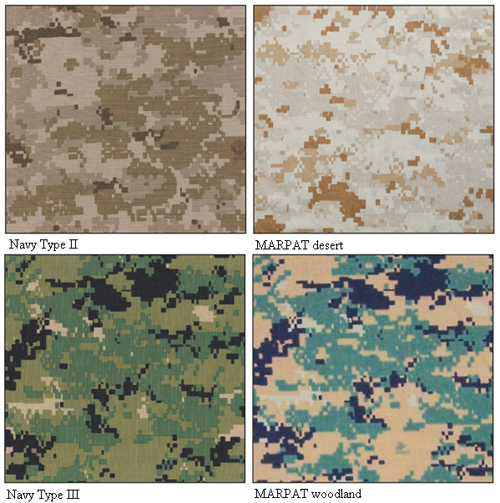 MARPAT on the Way Out? A bipartisan effort in Congress has resulted in partial sequestration cuts for the Department of Defense. Learn more in our first article. During a 2012 attack on an allied airbase in Afghanistan, one Marine went above and beyond the call of duty in defense of the base, earning a Silver Star in the process. Read more in our second piece. Congress has called on the Department of Defense to do away with individual camouflage patterns for the individual branches of the military, suggesting that they all share a common pattern instead. Learn more in our third article. Earlier this month, the Missouri chapter of the Daughters of the American Revolution recognized MarineParents.com's Founder and Executive Director, Tracy Della Vecchia, for her outstanding patriotism. 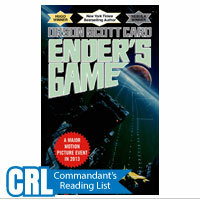 Read more in our fourth piece. Finally, the holiday season is upon us and that means it's time to be with family and loved ones. 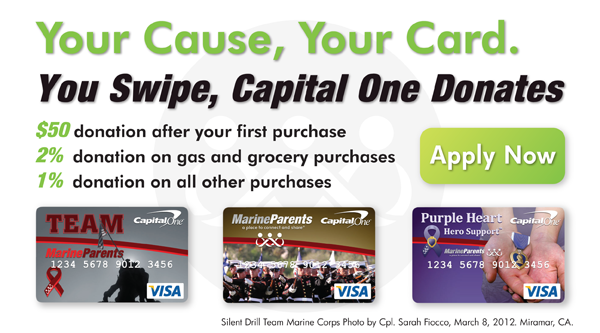 Unfortunately, many military families aren't able to spend their holidays this way. 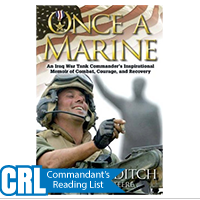 Our fifth and final piece looks at one young Marine who was able to surprise his family with the ultimate holiday gift--an early homecoming. On Tuesday, December 10 the heads of the congressional budget committees announced a deal that would partially protect the Department of Defense from automatic spending cuts. House Budget Committee chair Rep. Paul Ryan (R-Wis.) and Senate Budget Committee chair Sen. Patty Murray (D-Wash.) presented the bipartisan effort that would undo approximately $63 billion of sequestration cuts over the next two years, which would then be distributed evenly between domestic and defense programs. 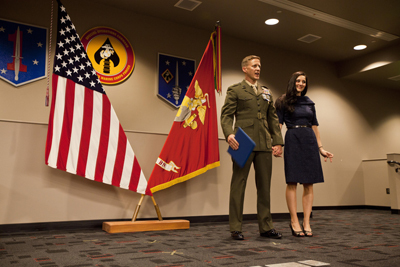 Maj. Robb McDonald honors his wife, Jennifer, after receiving the Silver Star for his efforts against an enemy attack aboard Camp Bastion, Afghanistan in 2012. A Marine was awarded a Silver Star on December 12 at a ceremony in San Diego for his actions in a 2012 attack on Camp Bastion, Afghanistan. Major Robb McDonald, who at the time was the executive officer of Marine Attack Squadron 211, was asleep on the night of September 14, 2012, when 15 Taliban fighters disguised in U.S. Army uniforms cut through a fence and launched an assault on the camp's airfield with machine guns, grenades, and rocket-propelled grenades (RPGs). Despite being over a mile away, and armed only with a pistol, McDonald immediately took off running toward the airfield where, according to his award citation, his "decisive leadership and tactical expertise inspired his Marines to vigorously repel the enemy, thereby preventing additional friendly casualties and further destruction of aircraft and facilities." Marine Corps MARPAT, the pattern that started it all. Over the past decade, lawmakers in Washington have become increasingly annoyed with the amount of time and money the various branches of the military have spent developing elaborate new camouflage patterns. For years, all troops wore the same uniforms while deployed to the same location. These Battle Dress Uniforms, or BDUs, came only in the "desert" and "woodland" patterns. 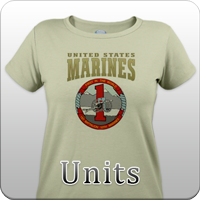 That all changed, however, in 2002, when the Marine Corps developed its digital-style MARPAT pattern. Since then, the various branches have spent millions of dollars and untold man hours on the development of additional new patterns. 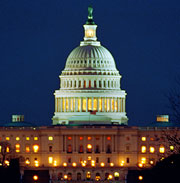 In response, Congress has included a provision in the National Defense Authorization Act for Fiscal Year 2014 that directs the Department of Defense to, "adopt and field a common combat and camouflage utility uniform, or family of uniforms, for specific combat environments, to be used by all members of the armed forces." 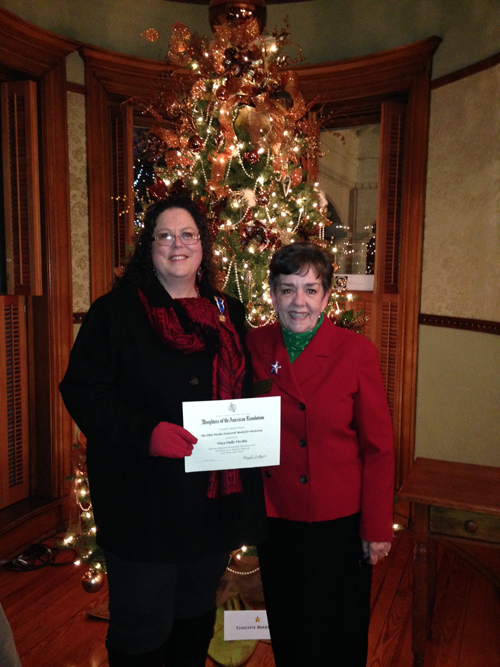 Earlier this month, on Sunday, December 8, MarineParents.com Founder and Executive Director Tracy Della Vecchia traveled to Boonville, Missouri to receive the Ellen Hardin Walworth Medal for Patriotism from the Missouri chapter of the Daughters of the American Revolution (DAR). The award, named for one of the organization's four founders, is one of four the organization has awarded since 1995 to recognize citizens who have given unselfishly of themselves and/or their talents to their community, state, or nation (the others being the Eugenia Washington Medal for Heroism, the Mary Desha Medal for Youth, and the Mary Smith Lockwood Medal for Education). Della Vecchia received the award, given to an American "who has displayed outstanding patriotism in the promotion of the American ideals of God, Home and Country", in a ceremony at Roslyn Heights, a historic mansion in Boonville that serves as the DAR's state headquarters, that included the lighting of the organization's "Stars of Patriotism" tree. Della Vecchia was nominated for the award in April 2012 by Marie Kosewicz, a DAR member in the "Valley of the Meramec" chapter in Washington, MO, and former Marine Parents volunteer, who felt that Tracy's commitment to supporting our troops, Wounded Heroes, and their families was worthy of recognition. After receiving the endorsement of the Columbia, MO chapter and undergoing a lengthy and specific application process, the award was approved by the National Board of Management earlier this year. In addition to presenting Tracy with an award, the Daughters of the American Revolution also decided to donate a check for $1,000 to MarineParents.com this month after learning of and recognizing our organization's accomplishments. "It's an honor to be recognized by a stellar organization [DAR] whose mission is to preserve the rich history of our great nation," Della Vecchia said, "The values of their organization parallel our own [Marine Parents'] core values, and these women can trace their lineage back to the men who fought in the Revolutionary War, so to be recognized by them for patriotism is very special." A Pennsylvania Marine family got quite a surprise, and an amazing Christmas present, during half time of a Pittsburgh Steelers game last Sunday, December 15. 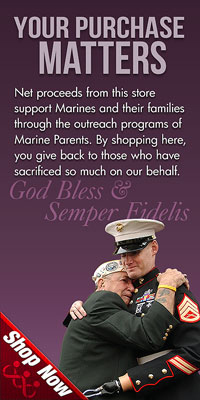 As the first half wound down and the two teams headed to their respective locker rooms, the family of LCpl. 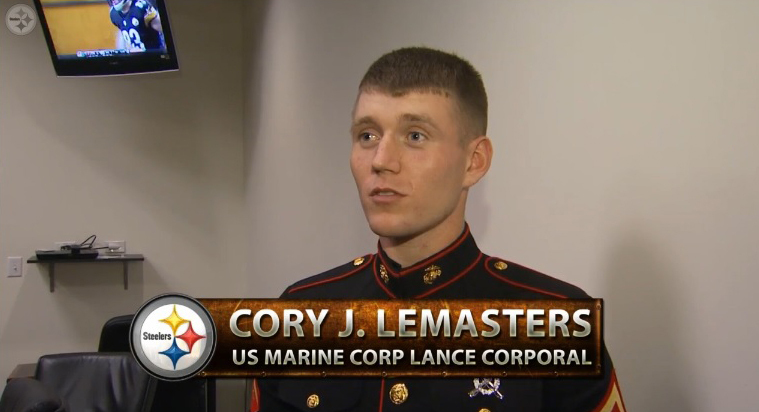 Cory J. Lemasters was called onto the field to receive an award honoring the young Marine, who deployed to Afghanistan in 2012 and wasn't supposed to come home until 2014. As his family watched a video of Lemasters on the stadium's jumbotron, the crowd erupted in cheers and gave a standing ovation as the Marine walked out of a tunnel onto the field, much to the shock and joy of his family.